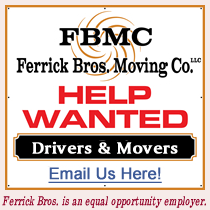 Ferrick Bros. Moving Company, which is headquartered in Haverhill, Massachusetts, serves the Merrimack Valley, North of Boston, Southern New Hampshire, Maine, the East Coast and beyond. A family owned business since 1996, Ferrick Bros. Moving Company specializes in Commercial, Industrial and Residential moving services. Ferrick Bros. Moving Company also has storage and portable storage facilities available to fit any storage need.